Every day papers and emails come into my life from various sources. It is a never ending cycle. It is difficult for me to be productive if I see papers all over the place, so I have established a paper organization system with a spot for all incoming items. It took a while to become a habit, but it really works for me. This post may contain affiliate links. Your cost is the same but it helps support this site and the free resources we share. See our full disclosure policy here. 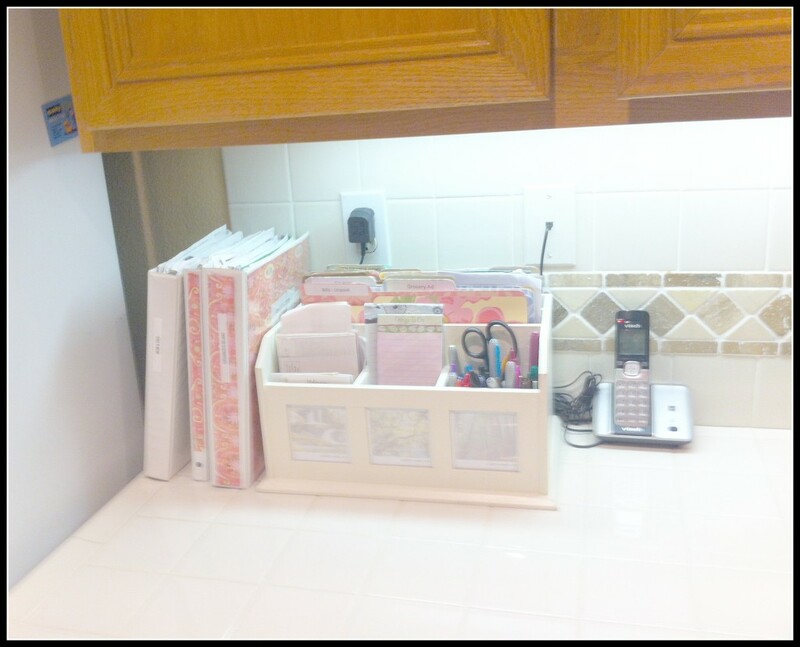 When I am at home, I spend a lot of my time in the kitchen so this is where the paper organization center starts. Establish the center in a place where you open mail, review correspondence and can access often. I have a small command center on a counter. My goal is to keep all of the information that comes in organized and accessible for future action, while keeping a little paper as necessary. 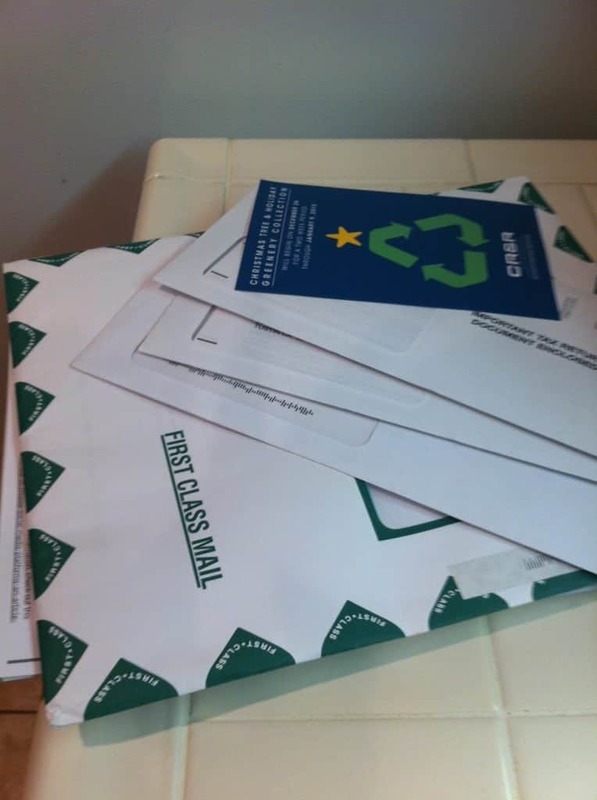 When I open the mail, items are either filed immediately or read and thrown away. If I need to keep the paper for future action, I file it in a folder. My folders include the following: Food Ads, Coupons, Unpaid Bills, Events/Entertainment and Receipts, to name a few. If I only need to glean bits of information from the incoming paper, I will take a photo with my phone and toss out the paper version. If the item is a document I will need for taxes or future use, it is filed in a filing cabinet in another room. If the item requires response or a payment, it is filed under unpaid bills so that I can respond later. To the left of this file box are binders for the major projects in my life. The binders are great because these projects require more storage space than a file folder offers. These binders include Household Information, Organized Island and My Parents. My parents are on in years and I keep medical and treatment records to help manage their health. I use other binders as well, but not as often, so I do not need to keep them in the kitchen. This is valuable kitchen property, so I try not to waste it. 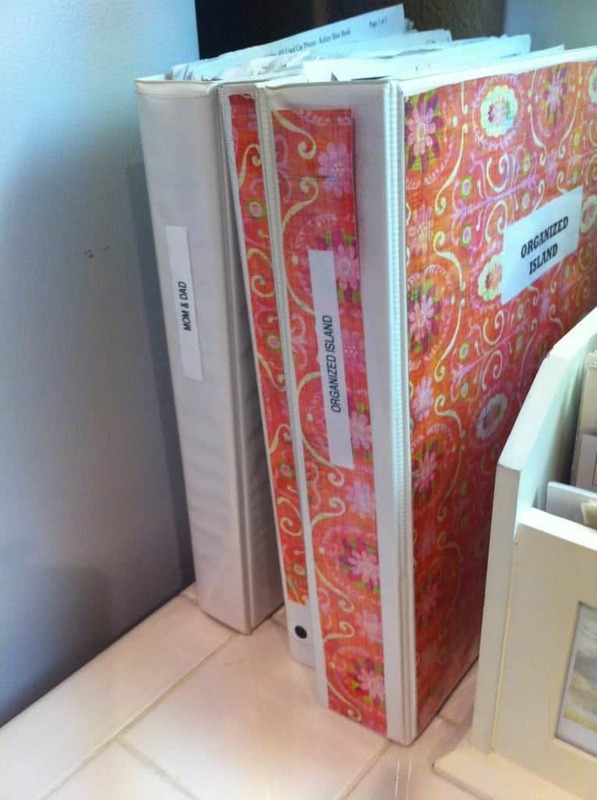 Binders can be changed up to match decor and can be organized any way you like. I appreciate this flexibility because the user can determine how they categorize the information. I like to buy the white binders and insert scrapbook paper on the front and sides to personalize. You can even change up the decorative paper once in a while! I also recommend a desk caddy like this one. I got mine at TJ Maxx, but you can find similar ones here and here. What system do you use to organize your incoming papers? If you liked this post, please share it. 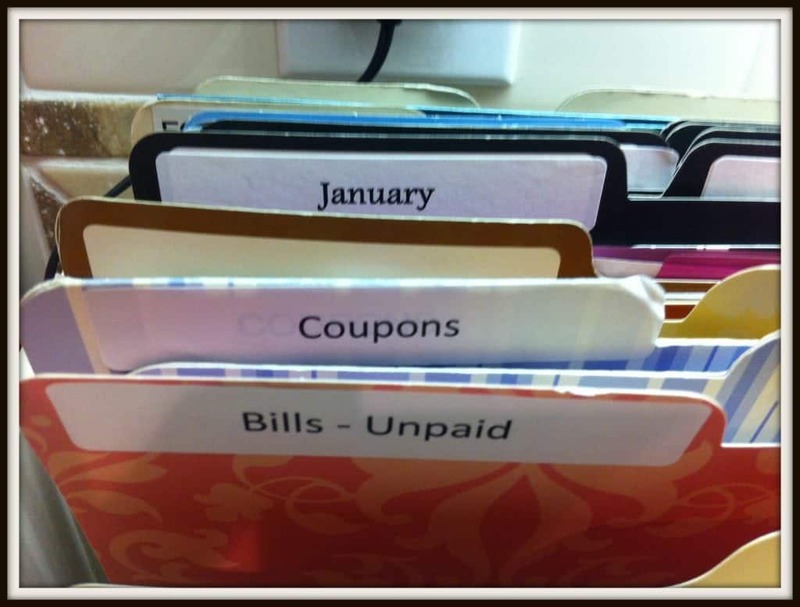 Paper Organization Tips – Tips how to store the information that is in paper form. How to Organize Keepsakes – Tips on what to keep and how to store those keepsakes. Organizing Rubber Stamps – Great tips on organizing rubber stamps and other small craft supplies. Thanks for stopping by Nicole! It just takes a little while to put together but is SO worth it! Thanks for stopping by Andrea! It really helps! I so need to be better about reading mail and throwing out and sorting. It looks like the paper factory blew up in here! Too funny! Thank you for stopping by Alexis. My current organizational goal is training my husband to throw away the junk mail. He always says he wasn’t sure if I wanted to see it!?!?! Honey? I don’t need an AARP application, but thanks!! Found you from SITS and I think this is a great idea. It’s much better than my current system of throwing it in a paper tray and hoping that it disappears over night. Thanks for stopping by Melissa! It really helps me. Ohh I so need to organize my papers, I finally this year bought a small calendar to write down and remember all the automatic payments that come out of my checking account so that I can make sure there is enough in there, and stop paying those we are pulling from here to cover over here. I am with you on the calendars Sonia. I have to write everything down. Happy Weekend! Yes, people have to find a system that works for them. There are different systems and I think you have to find one you can make a habit. Thanks for stopping by! I try not to have a lot of paper products…. we pay a lot of our bills online, so I don’t get a lot of paper bills anymore. Anything tax related goes in the file folder, and almost everything else gets shredded! Yes, I agree electronic bills and online payments really help reduce paper clutter. I don’t really use any system to organize my papers. Which isn’t good. But I love yours!! Thanks for stopping by Tracie. I hope you can make it work for you. I appreciate your comment. What do u think about scanning instead of filing most paper? I tend to use my phone as a scanner because it is convenient. My scanner is in another room but I do use it for some things. Scanned items still need to be categorized and purged so it really depends on the document and how long I need to keep it as to whether I will scan it. Great question! Such a great post! If you don’t stay on top of paper, it will take over! Great system you have created. Thanks for sharing it! I agree Tabitha! Thanks for stopping by! Start is a great word! Thanks for stopping by! So happy to inspire Linda! It really works! Thanks so much for the tip! My papers always end up in a pile on the kitchen counter and never make its way over to the office – so it totally makes sense to throw or file it right away in the kitchen! Thanks for stopping by Grace – glad you found it helpful! I am proud of you – especially the binder with Mom & Dad’s records! Way to go, Sis! Thanks Albert! You’re the best brother! Yes! Are you willing to share where you purchased that GREAT organizer, please!?!? Thank you for the wonderful ideas! Yes, of course Jenn, it was from Home Goods and I think it was around $10 or so. A wonderful post! You are a super organised lady for sure!! I love organising too, but just from the layout of your Blog I can tell you are a pro. Love the Blog and the posts, going to keep checking out the recipes…. So nice to meet you! Thanks for visiting Jeanine! Visiting from SITS, I have an organizer like that on my counter but like your tabs, I have some of the same but will be adding the others. Sounds like you have a system that works! Love that Dana! I love the visuals in this post, getting to look at your system is great. If I was there I’d want to pick up one of those binders to see how you organize those. Do you three hole punch everything? Maybe you did another post you could link to with the inside. I should do a post on the inside of the binders. Yes I hole punch most of the items or keep them in pockets. He he…at least you have a cabinet. Thanks for stopping by Aruna! Ugh! Paper. The ever present mess. I’ve worked out a few parts of my system, still taming a few others. Looks like you’ve got a great system. Maybe one or two of your ideas can help me finish up my system. I am glad that you found something helpful here Robin. Thanks for stopping by! Thanks for the information about using binders and immediately dealing with mail. Enjoy your Sits Day. Thank you Sheila…hmmm wonder what happened. I appreciate you stopping by! Happy SITS Day! Well, at least I manage to throw out the junk mail as soon as it gets in…and I keep the kindergartener’s stuff in a magazine holder in the pantry. But my “important” papers just have a little stack in the pantry jumbled up together. Maybe I’ll try the binder thing. I try to deal with papers and either trash or file them right away, but sometimes there are things that need to stay on the back burner for a while. We are planning our new kitchen, and I’m having two paper slots (kind of like mail bins in an office) under the desk/cabinet area – so papers are not everywhere but they are within reach and in my line of vision so I don’t forget about them. Oh I love the idea of paper slots! Congrats (in advance) on your new kitchen. How fun to plan it! I like your idea of the folders…I am in the process of trying to figure out what the best system is for us in the kitchen! That might just work!! Thanks Michelle, yes finding out what will work for you is key so that you can maintain it. Appreciate you stopping by! Sometimes it is hard when the papers keep coming at ya! Thank you for stopping by! I am inspired! I have so much… paper around. The accordion file just isn’t doing it anymore! I really need to, at least, get a mail caddy. The mail caddy works great. I just do not like seeing piles. Thank you for your sweet comment! Yes, the key is to find which method will work for you. Thank you for stopping by Jamie! This is a great idea! I want to incorporate this into my own organization. Great ideas. I’ve been meaning to get one of those organizer stations. I love the binder idea too. I have just the spot in the kitchen for this. Thanks! What great ideas!! I love the binders idea- and changing the covers to add to the house decor! That is awesome! Happy SITS day! Thank you Chris! They really help! I have a paper center in my kitchen also, but it is a lot smaller and I have mine hanging on the wall, because I do not have much cabinet space. I like the binders you use. Thanks Laura – your hanging system sounds great! Brilliant! You’ve given me the perfect way to organize myself when I finally get to move back in with my fiance! 🙂 thank you thank you thank you! You are welcome and Thank YOU for stopping by Cassandra! Great post! Stopping by from SITS.I like the folder idea. Thanks! I’ve got this kind of system going pretty well in my home – now I just need to replicate it in my office! Yes, see what will work best for you. You will love not seeing the piles. Great ideas! Happy SITS Day! I really struggle with mail piling up. Thanks for these wonderful tips! I’m going to try harder to stay organized and this will surely help! Thank you Jackie! I am glad you find them helpful! Thank you for stopping by Jean! I need to do something like this. Usually mail sits on the counter for a while until it gets sorted and then eventually makes it to the office and one day it gets filed. 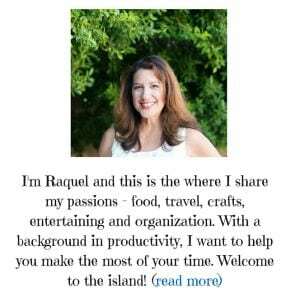 I wish I could be HALF as organized as you are, Raquel! Love how pretty and organized your command center is. You’ve won the battle with paper clutter in such style. 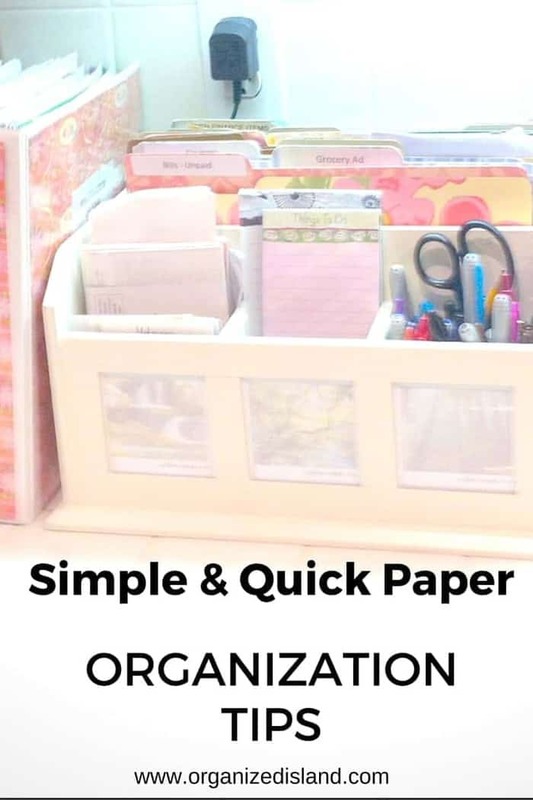 Congrats, you’re featured this week on Simple Organization Ideas – The Best of the Best at Organized 31. 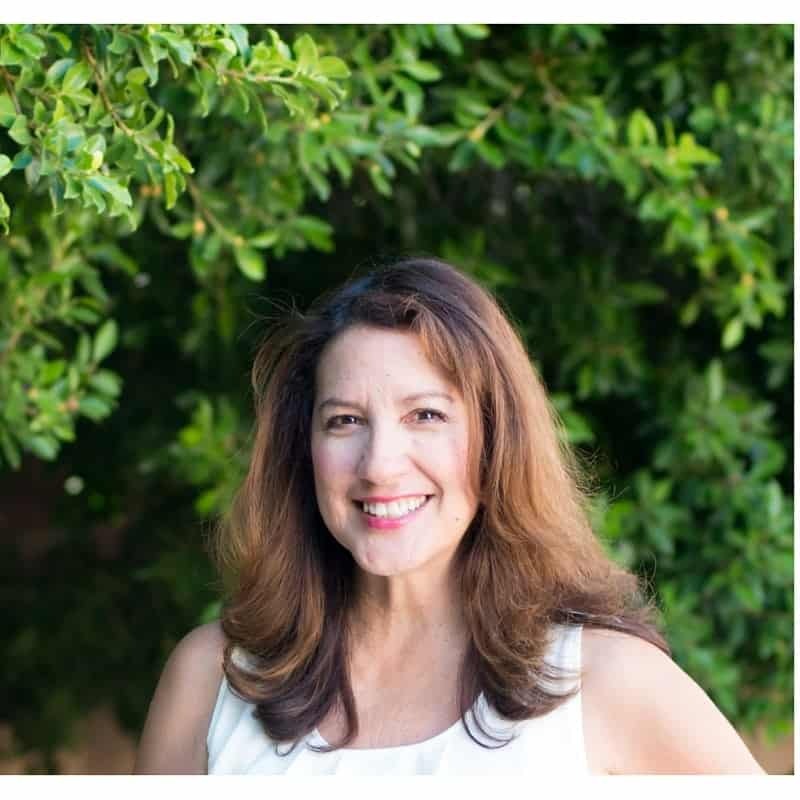 Thank you so much Susan – you made my day!